Nuts, designed for application in aviation, are made in a variety of sizes and styles. Common materials used in aircraft nuts are hardened steel (cadmium plated carbon steel), corrosion resistant steel (CRES), stainless steel, and anodized 2024 tempered aluminum alloy. All nuts can be acquired for either right hand or left hand thread applications. Nuts, unlike bolts, have no identifying marks or lettering for air in identifying the type of nut. They are, however, easy to identify by the luster of the base metal, the type and style of locking device used, and in the shape in which they are machined. Aviation nuts are generall described in two groups, self-locking and non-self-locking (standard) nuts. Non-self-locking nuts have no secondary safety device incorporated into the design and normally require an external locking device (such as lock washers, cotter pins, or safety wire). Self-locking nuts feature a safety device as an integral part of the nut design. The most commonly used and familiar non-self-locking nuts utilized in aviation include the plain nut, castellated nut, shear nut, plain hex nut, and light hex nut. The plain nut is essentially a common nut designed and built with aviation grade materials and to specific aviation design specifications. The appearance of this nut looks just like those nuts you find on everyday items such as bed frames, automobiles and elsewhere. THe aircraft version of this commonly used nut is an AN 315 nut and is built to aviation standards for hardness and thread/hole tolerances. 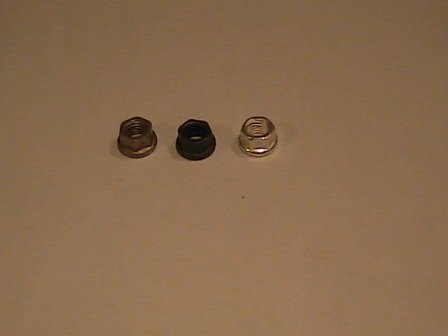 Do not confuse these simple looking nuts for hardware store or automotive grade nuts as they are not. Hardware store and automotive plain nuts or any similar nuts are not built with the material strength or corrosion protection or strict design tolerances as those found in aircraft nuts. The castle nut is used in unison with AN bolts, clevis bolts, eyebolts and studs with holes drilled in the shanks. This nut looks like a plain nut with a crown on top with slots resembling the embattlements (castellations) ona medivel castle. The castle nut is an AN 310 nut and is designed to be fairly rugged and handle large loads in tension. The castellations of the nut are designed to allow access for the use of a cotter pin or safety wire for additional retention properties of the hardware. The castellated shear nut is of similar style and shape as the castle nut but is not as thick (deep) as the castle nut (it is the thin version of the standard castle nut). The thin design makes this nut weaker than the castle nut and is used only where shear stress forces are encountered. In AN hardware a castellated shear nut is an AN 320 nut. The plain hex nut, AN 335, is essentially a plain nut with course threads. The nut is very rugged and is suitable to be used in large tension load areas however because it has no locking features this nut is only found in very limited use on aircraft. A typical application of this nut would be on magnetos in conjunction with a plain and lock washer combination. The light hex nut, in both fine and course thread (AN 340 and AN 345) is a much thiner version of the plain hex nut and requires the use of an auxillary safety device. This nut can be found used in various light tension applications on the aircraft. The plain check nut is used as a locking nut for plain nuts, threaded rods, set screws and other similar applications. This type of nut is thinner than the plain nut but similar in appearance and is an AN 316 nut. The wing nut is a very distinctive nut in its appearance looking like a small cone with large wings set 180 degrees apart. There is typically a hole in one of the wings or ears for use of safety wire to secure the nut from rotation. The wing nut, AN 350, is used in applications wher an item may frequently be removed and where the required tightness needs only be finger tight. Self-locking nuts have an integral auxillary safety device in their construction. There is a wide variety of style of self-locking nuts available and their use has become very popular since being introduced. 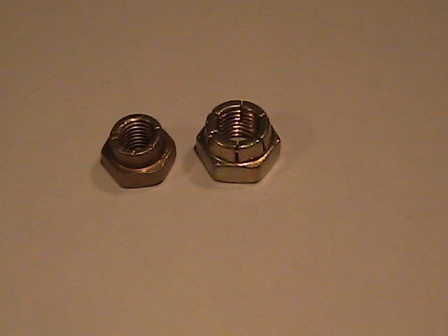 The intended use of these nuts is to provide tight connections that will not come loose under vibration. Self-locking nuts are generally not used in applications that subject the nut to rotation however this practice can be found in some applications where a self-locking castellated nut is employed in some flight or throttle control linkages. You can typically find these nuts used with anitfriction bearings and pulleys so long the inner race of the bearing is clamped to the supporting structure in a manner that will avoid misalignment, and rotation when tightening the hardware. Some additional common applications of self-locking nuts are when used for the attachment of accessories such as anchor nuts for small tanks and around inspection holes, attachment of rocker box covers and exhaust system components. Self-locking nuts can be categorized into two basic groups, the all-metal and fiber lock types. 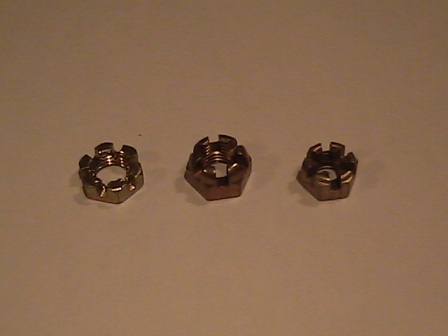 There really is a multitude of self-locking nuts available, more than we really need to get into for a basic introduction or discussion, therefore we will limit ourselves to the following self-locking nuts: the metallic- we will look at the boots and stainless and for the fiber insert type- we will use the basic elastic stop nut. The Boots self-locking nut is an all metal, one piece design intended to hold components tight under severe vibration. The Boots nut is basically two nuts in one unit, a load carrying protion and a lock nut. 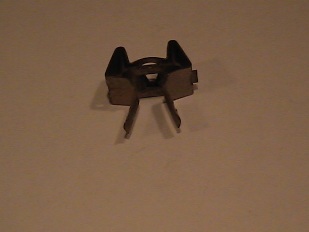 The two sections are joined with a spring which is integral to the nut. The spring seperates the two sections of the nut so each set of threads is out-of-phase with each other. The spacing is such that a bolt pasing through a load carrying structure must push the locking section outward against the spring to engage the threads of the locking section properly. The spring then applies a constant locking effect on the bolt in the same direction of force required to tighten the nut. The load-carrying protion of this nut has comparable thread strength to that of a standard nut and the locking section applieas force against the threads of the bolt to firmly retain the joint. This is a reusable nut and can only be removed by the use of a wrench when properly installed. Boots nuts come in a variety of styles and materials to fit many different applications. This nut is not all too commonly encountered in todays aircraft designs but may still be encountered and is why it has been presented here. Generally, the concept of the Boots nut of creating an out-of-phase condition applies to all metallic self-locking nuts. In most hardware commonly used today a saw cut or the outer threads of the nut are pinched to create this out-of-phase condition. It should be addressed that the locking action of the all metal nut is entirely dependant on the resiliency of the metal. There is a metallic nut that is a little more special and it is the stainless steel self-locking nut. Note the kerf cuts on these aircraft metallic self-locking nuts. The stainless steel self-locking nut can be turned on and off with your fingers. The locking features of this nut are such that the locking action only occurs when the nut is seated against a surface and tightened. Like the Boots nut, this is a two piece part, a housing and a case, with a key and beveled lock shoulder insert with a keyway slot. Since the nut and insert are not deformed and of the same size as the bolt or stud, it turns on easily. When the nut is turned to be seated against the surface structure, the shoulder of the insert is pulled down and wedged against the locking shoulder in the nut case. This causes the threaded portion to compress and apply force against the bolt. The elastic lock nut or self-locking fiber nut appears as a basic nut with an additional head to its height to allow room for the fiber insert to be installed and retained. The fiber insert is surprisingly very durable and tough and is also resitant to most chemicals and not affected by hot or cold water. The fiber insert will not damage bolt threads or the corrosion resistant coating applied to the bolt. The insert is (initially) unthreaded and of a slightly smaler diamter than the thread size of the corresponding bolt or hardware. The nut will start easily until the fiber portion of the nut is reached. At this point, the nut is secured onto the bolt and the fiber insert will push toward an outward position as friction increases. This action causes a heavy down force even when the threads break through the opposite side of the fiber collar. It is through this friction and downward pressure that provides the positive locking of this nut even under servere vibration. Unless otherwise noted, the general rule of thumb for reusing fiber locking-nuts is: if the nut can be turned through with your fingers- replace it. Generally, elastic stop nuts can be used many times in complete safety before the locking efficiency deteriorates below acceptable levels. After installation of a self-locking nut, inspect the installation to ensure the hardware extends at least 1/32 inch beyond the nut. Bolts with damaged threads, rough ends or a 5/16 inch or larger bolt with a hole in the shank and having burrs at the hole are unacceptable for use with fiber-locking nuts. Do not tap (run a tap through) the fiber insert. Fiber insert self-locking nuts are limited in application to a temperature of 250 degrees F. The reason for this limit is because the effectiveness of the self-locking properties will reduce beyond this point. Someone at some point in time had the homebuilders heart when he/she designed our next little item, channels. A nut channel is a metallic channel with multiple fiber or metallic self-locking nuts attached. This arrangement allows for a clean installation of the channel, needing only a few attachment locations on the structure with multiple locations on the interior of the structure. Some other forms of Aircraft Nuts. Tinnerman Nuts- Flat plate nut for inspection holes used in conjunction with AN530 and AN531 type B screws. Anchor Nuts- We normally call these handy little items nutplates. They essentially are nuts mounted on a plate either fixed or able to float and retained in position by the use of rivets. Instrument Nuts- At some point you will learn to dislike these little buggers. 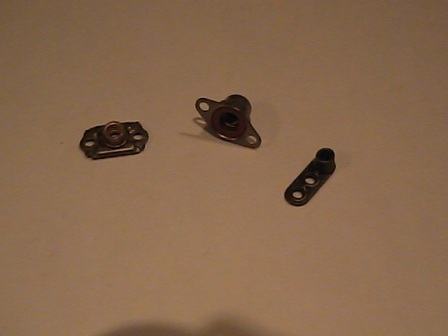 Instrument nut are brass/bronze plates with legs that insert into the mount hole locations of aircraft instruments. Their only use is for mounting of aircraft instruments. Internal and External Wrenching Nuts- There are a few types of commercial high-strength internal and external wrenching nuts available. They are heat treated nuts and capable of carrying high strength bolt tension loads. Letters and digits following the basic AN part number identifies the material, size, thread pitch and left or right hand thread. B= brass, D= 2017T aluminum, DD= 2024T aluminum, C= stainless steel, a dash in place of a letter indicates cadmium plated carbon steel. The digit or two digits after the letter or dash indicates the thread pitch and size. A dash 4 will fit an AN4 bolt (1/4-28), a dash 5 will fit an AN 5 bolt (5/16-24) and so on. The code numbers for self-locking nuts ends in either 3 or 4 numbers. The first two digits indicates the nut size in 16th of an inch and the last two give the thread count. Source: AC65-9 "Airframe & Powerplant Mechanics General Handbook with index", U.S. Department of Transportation, FAA.